Offers: Numerous discounted packages available dependent on time of year, number of golfers etc. See website for detail. Superb Grade II Listed Country House Style Clubhouse with All Facilities. Fully Stocked Professional Shop. Golf Practice Area. 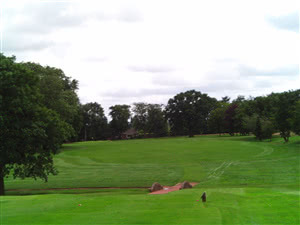 Leigh Golf Club is an old established club located close to the village of Culcheth some 6 miles from Warrington. The course, with its narrow tree lined fairways, several dog legs and occasional streams, provides an interesting challenge to all levels of golfing ability. The clubhouse is a two storey Grade II listed ex private boarding school for boys. The ground floor contains the Gentlemen's Lounge, the Dining room, the Mixed Lounge and the Gentlemen's Locker Room. The first floor hosts the Snooker Room and the Ladies Lounge and Locker room. Visitors are welcome. Contact club to make arrangements. The course and club look quite special but let down by the following. I can understand clubs trying to protect their courses in winter but if they are going to charge the same price it leaves you wishing you'd paid a bit extra and gone elsewhere. Nice little course near Manchester. I played in and mats were compulsory on the fairway. These are little bits of plastic grass that you carry around to pick and place the ball on. Not everybody gets on with them. £15 online is good value in the winter, so long as you can get on with fairway mats.